I recently read about, and then visited Prinzessinnengarten. 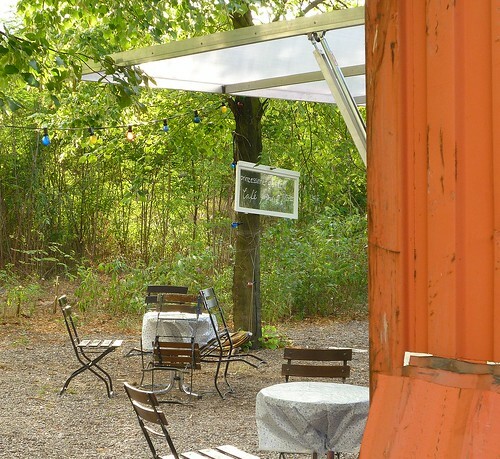 It immediately became one of my favourite places in Berlin. Robert and Marco welcomed me, and didn’t think my idea to grow fruit to bake with completely insane. 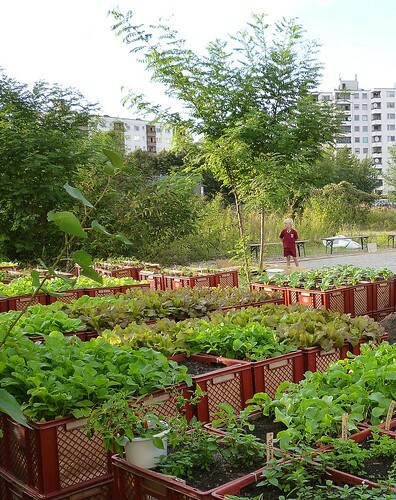 Prinzessinnengarten is an urban garden, it’s on a long disused site on one corner of Moritzplatz roundabout. The terms of the lease mean that everything has to be moveable, so all their veg is grown in cartons generously donated by Märkisch Landbrot. Their own website can tell your far more including how to get involved. This weekend they’re running a Stadtsafari to try and get 11 to 16 year olds to think about how openspace is used in their local environment. My idea to grow fruit won’t go anywhere this year – it’s too late to start planting – but hopefully next year I can get some Berlin raspberries, blueberries, etc. planted up and then Hudson’s can bake with really locally ingredients. In the meantime we’ve supplied the cafe with cake on a couple of occassions…and work of mouth led us to supply Betahaus next door.